Charlene, my RV, at Parkside Campground. I picked this site because two sides got sun for my solar panel. SEASONAL: Yes, approximately early May to late September, check with the Forest Service, BUT, this campground remains open for FREE after the season ends however there are no services, meaning no toilets or water, nor are the roads plowed of snow. Camper beware.The same is true for nearby Rattin campground. No. of sites: 26, plus two group sites Access: Roads to the campground are all paved (despite what my GPS said), as are the campground road and parking aprons. WATER: Yes, of the hand pump variety. It takes two hands to operate the pump, one to hold up a spring loaded, knurled brass knob and one to pump, so a second person to hold containers under the spigot is an asset. It took maybe 20 pumps of the handle to produce water and at first it was cloudy… rusty looking. After pumping a few gallons of water it cleared up quite a bit. There was a large plastic bucket by each pump. I’m uncertain why it was placed there, but I used one to capture the water I pumped while flushing the system then pour it down the nearby drain. Without it my feet might have become wet. I also used the bucket, inverted, to place my water jug on so I could more accurately aim the water flow from the spigot into its neck. Doing so allowed me to spill very little. TRASH: No. The concessioner running this campground also runs Greenough Lake Campground a mile up the road and even though sanitation workers have to pass this campground to get to Greenough the concessioners are apparently too cheap to put a dumpster here too. Perhaps there’s another reason, but a Forest Service employee told me it was the decision of the concessioner. A sign on the campground signboard instructs campers to take their trash to Greenough! Dump: Red Lodge, MT (info from SaniDumps.com): The Chamber of Commerce, Perry’s and KOA which at $20 charges twice as much as the former two. Propane: Red Lodge, MT (info from AllStays.com): Northern Energy, 11124 N. Broadway Groceries: Red Lodge Other: Red Lodge is a small town but with number of shops, restaurants, etc. CELLULAR: Both my AT&T iPhone 5s and Verizon iPad Air had no reception at all here. Both had connectivity in Red Lodge and it’s probably not necessary to drive all the way to town in order to get a signal. Forest Service literature lists the largest RV that can be accommodated as 40′ and I think that would include a towed vehicle. Most of the sites are a little on the narrow side, however, and I could see how a vehicle with slides on both sides would be cramped, at least in some sites. Some sites appeared to be doubles, but while they might have been wide enough for two passenger cars I don’t think two RVs would have fit, or even one RV and a car. Those sites weren’t all that long either. I was in site #12 in my 33′ long, 10′ wide Class C and had a good 10 of empty space in front of my RV when I backed in. The concrete parking stops at the end of the site were low enough that I probably could have backed in further allowing the tail end of my RV to hang over them which would have given me some more room had I needed it. Had I a second slide on the opposite side from my existing one I would not have been able to open it. Had my awning been on the other side of my RV I wouldn’t have been able to open it either. There were probably at least another 6 sites, maybe 10 or 12 of equal length in the campground. There are two loops: a road cuts off the entry road to the right just after entering and leads to the lower loop with sites 16-26. The sites in that loop are more level than many in the loop in which I camped. Most sites in the upper loop will require some leveling. I couldn’t get completely level in #12 with my leveling blocks but I opted to stay in #12 because there was good light for my solar panel. Most of the sites here are very well shaded. Sunny sites are the exception. Trees in the lower loop were tall and spindly with no greenery near the bottom and I preferred the feel of the upper loop which had more green lower down. I think road noise may have been more audible from the lower loop. 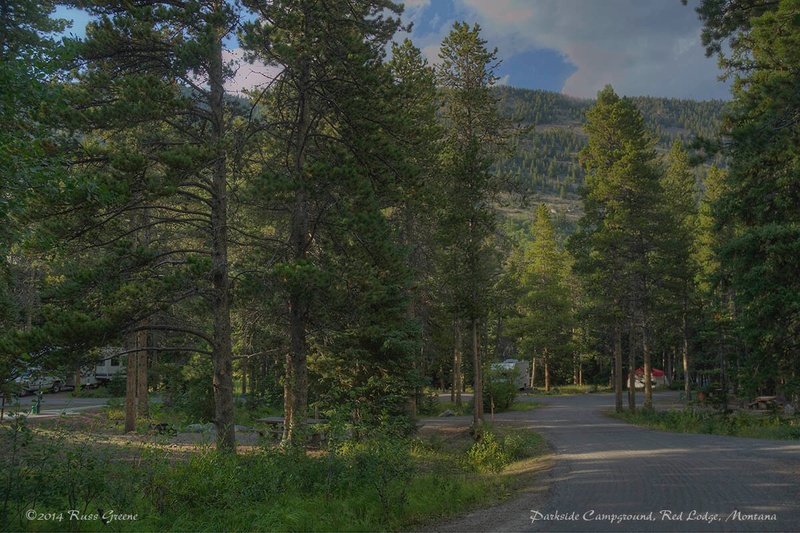 This campground is about 12 miles southwest of the town of Red Lodge along route 212. If you are traveling that direction you will see US Forest Service campground signage pointing you to turn left off of 212 before you get to Parkside. I don’t know anything about the campgrounds that road goes to other than one might be Ratine or Rattin… the spelling depends upon which literature you read. Parkside, Greenough Lake and Limber Pine campgrounds are adjacent to each other and all accessed via the same road known as Main Fork Rock Creek Road according to my Garmin 760LMT GPS, or 2421 in Forest Service speak, judging by the typical “brown stick” signage. My Benchmark Atlas has the road marked 421. So, there you have at least three designations for the road. It’s a right turn off of 212 if you are heading southwesterly on 212. Assuming reasonable accuracy of my handheld GPS unit the coordinates given above are at the turnoff to the road roughly 12 miles out of Red Lodge. There is brown and white Forest Service sign which reads “Campgrounds” near the turnoff. A short distance down that road you will come to another sign pointing right to Parkside and straight ahead to Greenough Lake and Limber Pine campgrounds as well as some other destinations. I like this campground. I like it because apart from the sound of the creek rushing by it and the wind in the trees there was very little else I heard. Vehicles on route 212, although not far away, were not for the most part audible, the exception being the occasional motorcycle belonging to a goon-headed biker who thinks everybody within a mile should hear his motorcycle. I ride motorcycles too, but I don’t modify the exhaust systems to make them louder. I also like this campground because it is very woodsy. When I looked out the window of my RV I felt as if I was in a forest. That’s because I was. The campground was largely empty when I was there just after Labor Day. 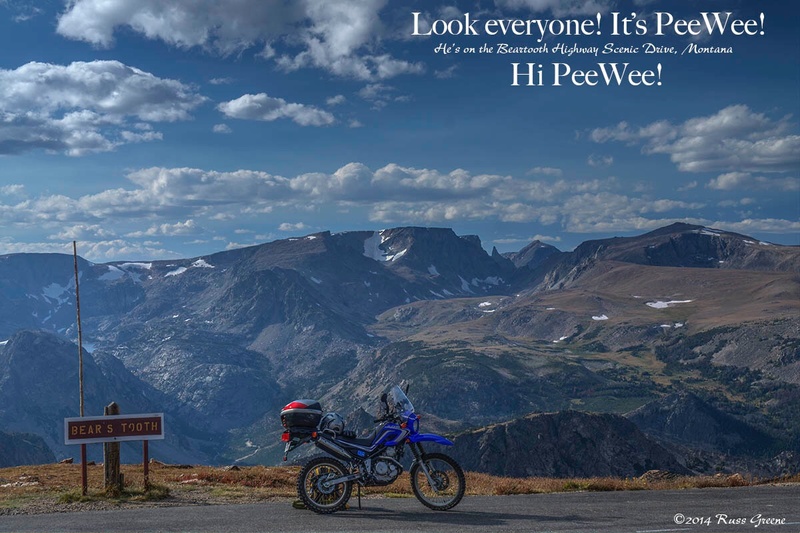 I chose to camp here because I wanted to drive the Beartooth Scenic Byway, part of route 212, but I didn’t want to do it in my motorhome, and Parkside is as close as you can get. 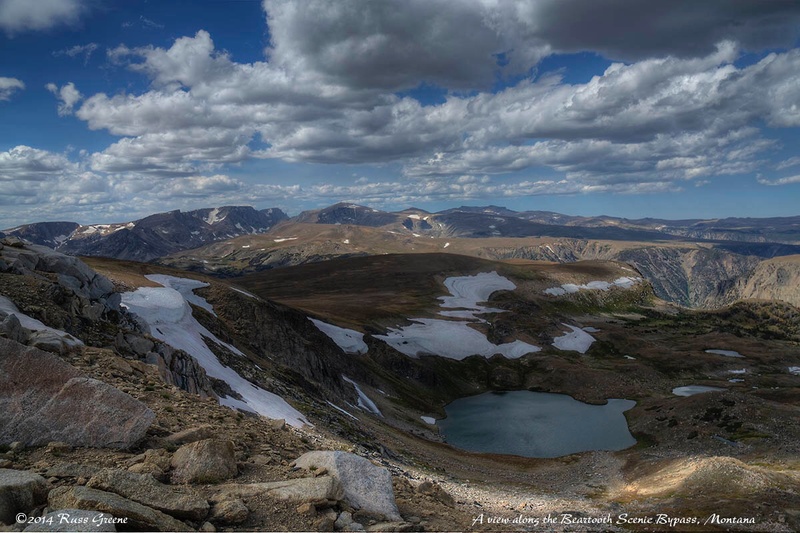 Just a short distance up 212 it beings to get twisty-windy as it climbs steeply toward Beartooth Pass at about 11,000′. Some folks have driven this part of 212 in motorhomes but the discussion about the road on IRV2.com swayed me not to drive it in my RV. From Parkside I could pop out of the campground on my motorcycle right onto the Scenic Byway, which, by the way, is a way fun ride for motorcyclists who enjoy riding the “twisties”. There are lots of curves and the road condition is good. The scenery is awesome too. I took a quick look at Greenough Lake Campground just up the road from Parkside and it seemed similar. 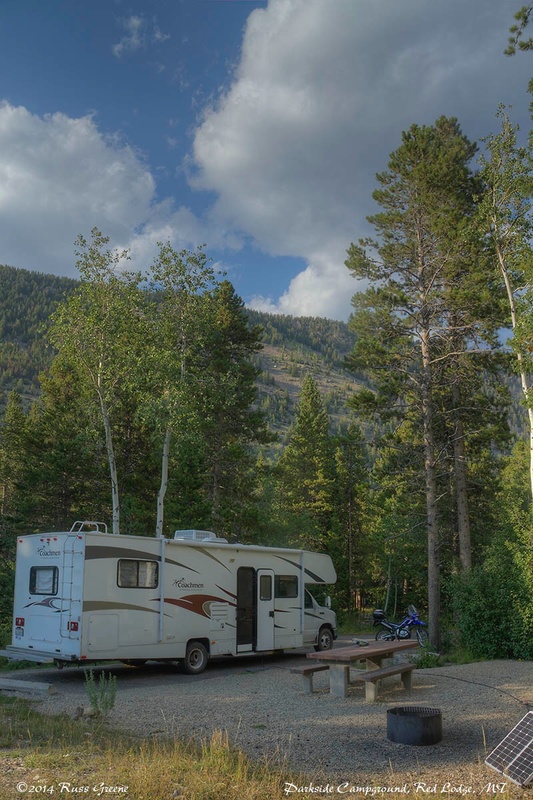 There are some sites there able to accommodate RVs up to 45′ according to Forest Service literature. Nearby Limber Pine campground was closed for the season so I didn’t look at that. If I recall correctly the road into Limber Pine was dirt and rough looking. 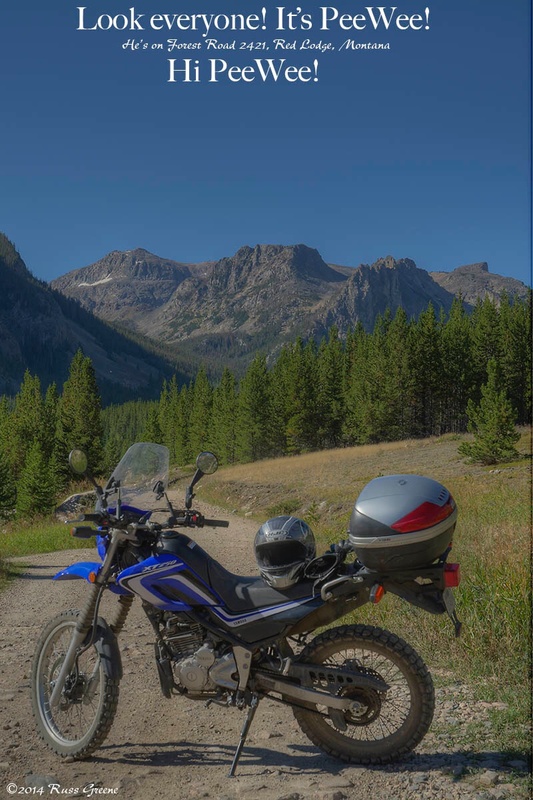 Further up the 2421 is a FREE Forest Service campground called M-K but the road turns to dirt just past Greenough and degenrates to a very potholed and rocky road well before M-K. I did see one trailer maybe a couple miles up 2421. I assume the owner was very skilled at maneuvering it up potholed, rocky roads. Either that or he erred in judgment going up there, possibly both. There were a lot of places along 2421 where it was clear people had camped, but I’m assuming most of them probably went up there with 4WD vehicles or motorcycles. I would not attempt that road with a Class C, Class B or Class A except perhaps the first 1/4 mile or so and even then I’d advise checking it out on foot first. If as an RVer you like quiet, woodsy campgrounds, don’t mind the absence of hookups or trash service, and your RV is something less than a 40’er, I think you will like Parkside.